Working under the supervision of faculty advisor Cortney Lollar, Assistant Professor of Law at UK College of Law, and local attorneys Carmen Ross and Lindsay Perdue, UK Law students utilized their legal education to teach real-life lessons in law and government to high school students, empowering them to go forward and make positive changes in the community, while also inspiring them to consider a future legal career. Lessons taught include criminal and civil law, employment law, housing law and family law. The idea for StreetLaw at UK came from the national non-profit organization that began in 1972, when a small group of Georgetown University Law Center students developed an experimental curriculum to teach District of Columbia high school students about basic legal principals. It was the vision of Prof. Lollar to establish one at UK Law and use the program to make a difference in the Lexington community. Following Prof. Lollar’s initial announcement of StreetLaw at UK, 60 law students quickly jumped at the idea to join. This meant that UK Law could place students in more than one high school. Bryan Station High School and Martin Luther King, Jr. Academy of Excellence agreed to be host schools. In December, the organization held elections to establish an executive board. The elected board members then drafted and approved a constitution and provided training to certify 30 student teachers. With strengths, diversity and law class variation in mind, student teachers were paired off to complement each other in the classroom. After modernizing problems contained in each lesson, student teachers gave trial presentations to coordinators and volunteer attorneys who provided valuable feedback and direction. “I’ve watched multiple presentations and I always enjoy seeing the different teaching approach each student takes,” said Thomas Wall, Outreach Coordinator for StreetLaw, who serves as a liaison between the high schools and the organization. 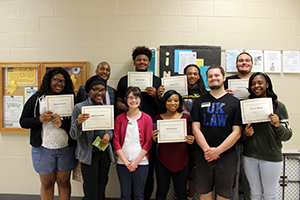 UK Law students successfully taught 20 lessons this semester, 10 at each of the two participating high schools, with 10 to 12 students at each lesson. At the end of the 10-week period, each participating high school student was presented with a certificate at an awards celebration in recognition of their accomplishment. Looking ahead to the next school year, the organization is planning to continue the initiative, with the hope of adding a third high school into the program.